Much Work To Be Done Outside! Due our extra long and very snowy winter, today is my first day working in the yard. There is much work to be done. The front yard flower border that was still under snow last week. The deep snow blanket kept the Shasta Daisies evergreen all winter. The Maltese Cross puts forth new green shoots. Last year's kitchen fairy garden. I have a new and improved kitchen fairy garden planned for this season. A very weathered chair waiting for a live plant. 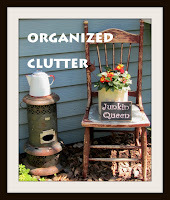 Lots of junk outside (and in the shed) waiting to become garden art again this year. The futon ends spent the winter outdoors and are very weathered! AND last but not least, my new potting bench is home at last! WOW! It will be so beautiful. Lots of work but the picture shows it is worth it. Yep it's going to be worth it. The last photo shows all its wonderful beauty! I'm green with envy over your potting shelf. That is exactly the style sink I want in my kitchen. I've been trying forever to find one out on my junkin adventures. No such luck and a new reproduction is just too expensive for my pocket book. Yep, I'm drooling away with envy. Yay for being able to see dirt and grass again! It looks like you have your work cut out for you, but the last photo is worth it. What are the tall red flowers to the front of that photo? It does seem overwhelming with so much to do, but it is so worth it when it's all done. Have fun and enjoy. We'll all be enjoying your pretty photos soon. I know your garden will look gorgeous again soon!! What a neat post! I love how you showed what winter left behind! Our snow just melted this weekend, so I've been outside cleaning up, too! I love your potting table!! 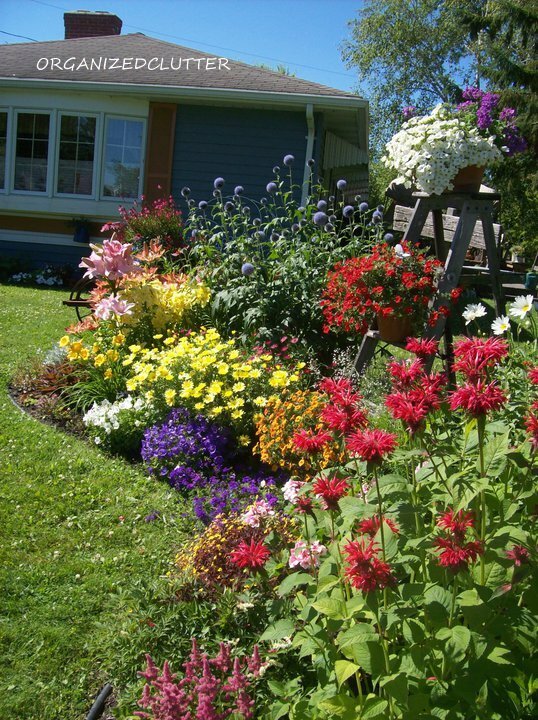 Will be looking forward to seeing your yard this summer! Ooh, I love that potting bench! And now there is more snow on the way here...what a crazy year! Hubby and I started cleaning that stuff last weekend, oh what a mess!! But look how gorgeous your gardens will be! I love all your cool yard stuff. 84 degrees here yesterday and now they are saying snow showers on Thursday...waaaa! I guess we get tough from living up North. Our garden is just starting to "wake up," too. I'm sure your fairy garden will be amazing again! I think I'll do one with my daughter this year. I think she'd really enjoy it! Wowsers! I'll be looking forward to the changes!! I'm afraid we are sending more white moisture your way :-( The good news is, your gardens are going to be soooo beautiful Carlene! You will make this look beautiful and I can't wait to see. Sorry the winter was so harsh for you, ours was tough here too. Our yard is a mess too. I can't physically do a lot of yard work so my husband has always done but with him bein unable to in the last 3 years you can only imagine what it looks like. Since he had his back fixed last Nov he's slowly getting out there and I will help as much as I can.. So happy the snow has melted and you are getting nice weather to start your yard work. I just add some potted plants, so not much digging for me. I know everything will be lovely. I'm glad you included the blooming color photo so folks that don't live in the snow can see. My window boxes look surprising similar to the your chair, we must of planted the same thing last spring. Seeing it in this state truly makes me appreciate all the lovely ways you infuse your junk into the garden to make it look amazing. I would say you have some work ahead of you. Hope the weather cooperates! Spring, long awaited...suddenly becomes 3x the work, I know :) !! Carlene, the whole time I was looking at these pics I was thinking, "she'll have it whipped into shape in no time at all". You will create your magic. I'm just glad that the snow is finally gone. I started rebuilding my fairy garden also. Love your new potting bench! Good Afternoon Carlene, I love Spring because it heralds a new beginning for plants. I love clearing away the debris and seeing what has survived, and it is amazing that your Shasta Daisies stayed green underneath all that snow. To think in no time at all your garden will look so beautiful... I cannot wait to see it.